How to Make the S Sound Spaghetti Clues! The S sound is such a tricky one for so many of our early elementary students to pronounce! 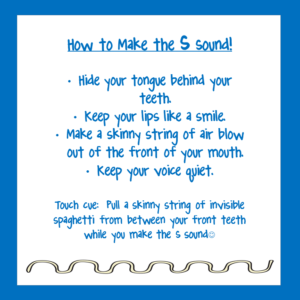 In this freebie, I’ve included a quick description of a mini lesson for teaching the S sound in the classroom, a poster, and a worksheet. There are so many touch cues and verbal cues for this tricky sound, but this is one that has worked for me!